Two new immersive audio sound bars have been revealed. 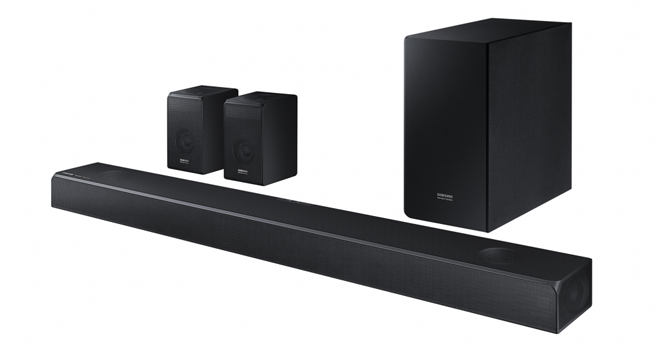 Samsung has announced the launch of its latest premium sound bar lineup. The new HW-N950 and HW-N850 have both been developed in partnership with Harman Kardon, and are set to start shipping on August 20. "Our collaboration with Harman Kardon – an audio leader for 65 years – is a major leap forward as we continue to push the boundaries of premium sound and design for our consumers," said Jongsuk Chu, Senior Vice President of Visual Display Business at Samsung Electronics. "Samsung’s market leading display technology and design paired with premium sound quality of Harman Kardon products is a winning combination for consumers." Both sound bar modes feature support for Dolby Atmos and DTS:X immersive audio formats. The HW-N950 features a main sound bar unit with up-firing and side-firing speakers, two wireless surround sound speakers with up-firing drivers, and a wireless subwoofer to complete a full 7.1.4 system. Meanwhile, the HW-N850 features a main sound bar unit with up-firing and side-firing speakers and a wireless subwoofer to complete a 5.1.2 channel system. In addition, both models have been certified by Harman Kardon through objective and subjective testing. "Samsung is the world leader in soundbars and we are extremely proud that they are enlisting HARMAN to enhance their audio quality and play a key role in growing their premium soundbar business," said Dave Rogers, President of Consumer Audio at HARMAN. "Partnering with Samsung, one of the most admired brands in the world, will broaden the reach and appeal of Harman Kardon and help us build our business in other consumer and car audio branded solutions. 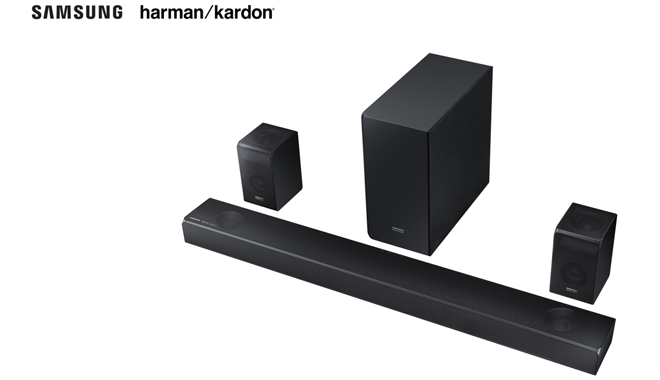 Introducing the new co-branded Samsung Harman Kardon premium soundbars is a win for Samsung, HARMAN and consumers, who now will have the best of video, sound and design altogether in one striking package." The HW-N950 7.1.4 Sound Bar carries an MSRP of $1,700 and the HW-N850 5.1.2 Sound Bar carries an MSRP of $1,198.